4 Minute Read: Chinese Medicine, holistic medicine, seasonal eating, plant-based, paleo, real food, self-care. Midway through March, the ice on the foreshore is finally melting. Warm-blooded Canadian kids are already running about in shorts, and eager songbirds are taunting my cats. After a dark winter here in Nelson, BC, the entire town is waking up and releasing a collective ahhhh. The shift in seasons also means adjusting how we eat, feeling out fluctuations in spring’s coming and winter’s going…then planning meals accordingly. Hot bowls of brothy goodness are still around, but on warmer days wild fish surrounded by colourful veggies take centerstage. Green soups have returned too, their emerald splendour matching new shoots appearing in backyard patches of soil. In Chinese Medicine, eating and living with the seasons is an important part of staying healthy. For each season, Chinese classics offer sage guidance for what to cultivate in our lives...and what to put on our plates. WHAT’S THIS MEAN DURING SPRING? Well, for starters, spring is a waking up. A time to see things in a new way. A time to engage with the world and to do something from a place of visualization and direction. From a Chinese Medicine perspective, the upward, outward movement of spring is an expression of active, ascending yang energy. 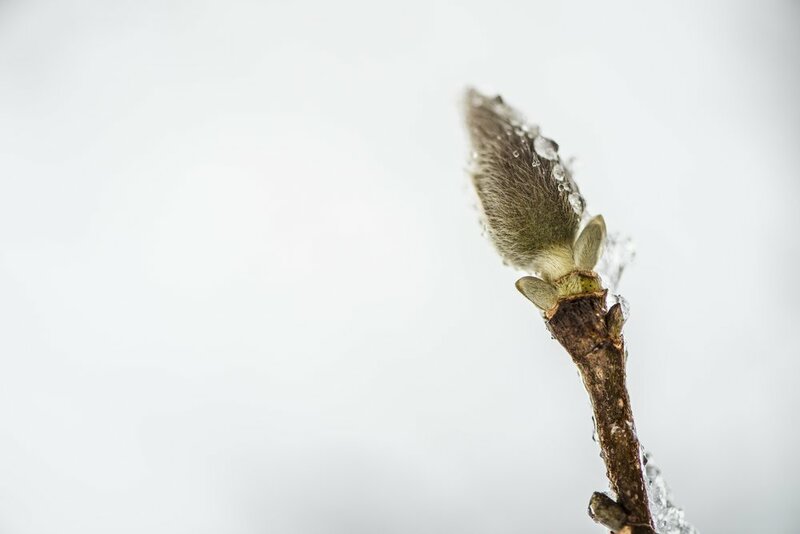 Springtime growth – and change – emerges from what we were cultivating deep within during the winter months that came before. It manifests the results of winter’s inward-focused reflection and introspection, giving birth to something original. We’re to spend more time outside...and more time stretching, moving and decompressing our body. The classics also advise appreciating the newness of life...and embracing self-expression while at the same time developing equanimity. Emotionally and physically, spring’s an excellent time for letting go and shedding excess weight. WHAT’S THIS HAVE TO DO WITH FOOD? A lot, actually. In Chinese Medicine, we don’t separate food and eating from the rest of life...or from wider patterns of living and being. What’s on our plate in spring is part of the bigger picture of seasonal attunement. This attunement – in all aspects – supports health and vitality throughout the year. Four sage guidelines for spring go this way. 1. Spring is a time to eat less and eat light. Compared to other times of year, portions should be smaller and food lighter in nature, reflecting the yang energy of the season. Avoid the heavy, dense foods of winter, instead choosing simple proteins surrounded by plenty of veggies. Greens are an especially good choice, as are cucumbers and fennel. 2. Cook foods for shorter duration at higher temperatures. Shorter cooking at higher temperatures makes foods more cooling. By cooling, I’m not talking about whether foods are hot or cold to the touch. Rather, I mean their intrinsic thermal nature and influence on the body after eating. As the weather warms, more cooling foods are called for. Spring is also an okay time to incorporate more raw foods for some people (though NOT anyone with digestive weakness, since raw foods are much harder to digest). In general, I recommend at least lightly steaming or sautéing the majority of your veggies. The nutrients in them will be more bioavailable that way. 3. Add pungent foods and spices, which move outward and up. The expanding, rising qualities of the pungent flavour support the expanding, rising momentum of springtime. Think onions, leeks, radishes, spicy greens, ginger, garlic, pepper and mint. In winter, a time of drawing inward and preserving our deep reserves, too much pungent is ill-advised. But with the arrival spring, moving outward is safe again. One caveat: For individuals with too much upward, outward, fiery energy, lots of pungent (even during spring) can make things worse. If that sounds like you, take it easy on the hot sauce! 4. Avoid salty foods, which pull inward and down. Whereas winter's a good time for drawing inside, in spring we want the opposite. Rather than move in, we want to expand out. Once again, a caveat: For individuals with too much upward, outward energy, adding a bit of salty can help anchor and ground. Seaweeds are a smart choice, since they’re also cooling. Make these changes during spring? Or have other seasonal tips? Please share in the comments!